Would you believe that? It probably comes as no surprise to many overseas visitors. You often hear comments like “I have never been so cold in my life as here in Australia!” And these are comments even from those used to harsh Northern Hemisphere winters. I don’t know, maybe it is a reflection on how depressing winter can be in Canberra or maybe it is because of a common perception that “Australia is such a warm and sunny place” (this is how Australia is normally portrayed in travel brochures) that the idea of snow and ski fields in this country is difficult to reconcile for some. 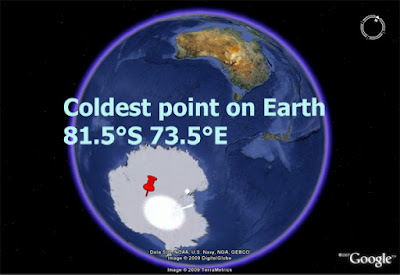 Now there is a "scientific proof" that one of the coldest places on Earth is in Australia, technically speaking… It is a place called Ridge A, located in the Australian Antarctic Territory (81.5 °S 73.5 ºE), where winter temperatures do not get much warmer than -70 degrees Celsius. It is an unusually calm place and is situated at 4,000 m above the sea level. The place was identified using satellite imagery and climate models as part of a study conducted by a team of astronomers at the University of New South Wales to locate an ideal spot on Earth for the ground based optical telescope. They have concluded that “Ridge A looks to be significantly better than elsewhere on the Antarctic Plateau and far superior to the best existing observatories on high mountain tops in Hawaii and Chile.” Never mind the cold!